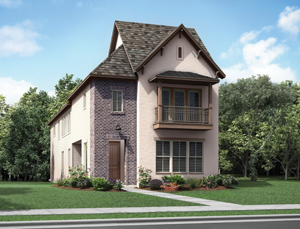 Darling Homes is the newest builder in Imperial, introducing two home collections in the Sugar Land community. Darling’s pricing in Imperial starts in the upper $300,000s. Imperial in Sugar Land is introducing a new builder as it nears its final phase of development. Darling Homes has started presales on two home series with modern exteriors in the community. The Retreat Collection features designs for 65-foot properties ranging from 2,896 to 3,814 square feet. The one- and two-story plans have three and four bedrooms, two to four baths, game rooms, media rooms and three-car garages. The series is priced from the $540,000s. A model home is expected to open in December. The City Collection – designed for 31-foot properties – offers 2,313 to 2,850 square feet, three to four bedrooms, three to 3.5 baths, game rooms, media rooms and two-car, rear-loaded garages. Pricing is from the upper $300,000s and a model home is slated to open in October. Darling will have 60 homesites in Imperial – 15 for the patio homes and 45 for the City Collection. Model homes are expected to open by the end of the year. Darling Homes is joining four other builders in Imperial – Gracepoint Homes, Meritage Homes and Partners in Building. Designs range from luxury Brownstones to high-end custom homes priced from the $450,000s to more than $1 million. Located on the site of the historic Imperial Sugar Company, Imperial is a pedestrian-friendly community offering easy access to Sugar Land attractions like the Smart Financial Centre, as well as activities closer to home such as baseball games at Constellation Field and a weekly farmers market. For more information, visit www.imperialsugarland.com.